Light Wash Jeans Intrépide in Brown. Wear an airbrushed masterpiece on any day of the week in these brown light wash jeans. Featuring distressed beige jeans with dark brown airbrushed effect outlining the seams. Airbrushed detail is custom designed by hand creating a rough, graffiti-like finish. 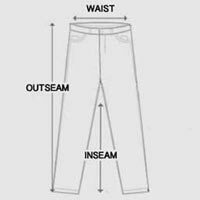 Light wash jeans made from heavyweight cotton with a mid-rise waist and slim-fit leg. Constructed with five-pocket design, belt loops, and brass three-button fly. Designed with extreme whiskering detail on the thighs and back of the knees. Airbrushed areas layered with leather-look coating for a multi-textural jean. When you want to look trendy without trying too hard, these brown light wash jeans are the perfect fit.